A marketing funnel is the process that leads a prospective customer through several stages on their way toward purchasing your product. It goes something like this: A lead becomes a prospect, who becomes a customer, who becomes (if you’re lucky) a repeat customer. The whole thing probably sounds daunting, and it kind of is: Sales funnels have been around for a long time, but they can still cause modern, technologically savvy businesses trouble. We’re going to discuss seven basic suggestions for dealing with sales and marketing funnel issues and recommend some tools to help you streamline and improve your own conversion process. With a bit of patience and some attention to the finer details, you’ll have your conversion process humming along like a well-oiled machine in no time. Any concerted effort toward building a better sales funnel needs to begin with building better leads. You need to pursue the people most likely to respond to your product or service. If you haven’t already, it’s probably time to get serious about learning (and possibly earning your certification for) Google Analytics. This free service will help you drill down into the nitty gritty of how people are finding you in the first place—whether it’s social channels like Facebook and Pinterest, or whether they’re more likely to find you through organic search results. If your leads come from Facebook, you’ll want to double down on your Facebook strategies or borrow from your Facebook success and provide similar content on other channels to capitalize on your success. Almost everyone has abandoned a shopping cart or turned tail halfway through a signup process. If you’re hoping to iron out the kinks in your own marketing and sales funnels, you’ll need to eliminate as many bottlenecks and sources of customer consternation as possible. Prospects arrive at the Basecamp homepage from a variety of media channels, such as blogs and social websites. Prospects sign up, which requires no credit card and only basic personal information. Prospects are offered a generous 60-day trial for signing up, no strings attached. That’s it! Basecamp has been around for a while, and it has the benefit of name recognition and countless testimonials, but it’s still a shining example of what’s possible when companies get serious about eliminating bottlenecks from their signup process. 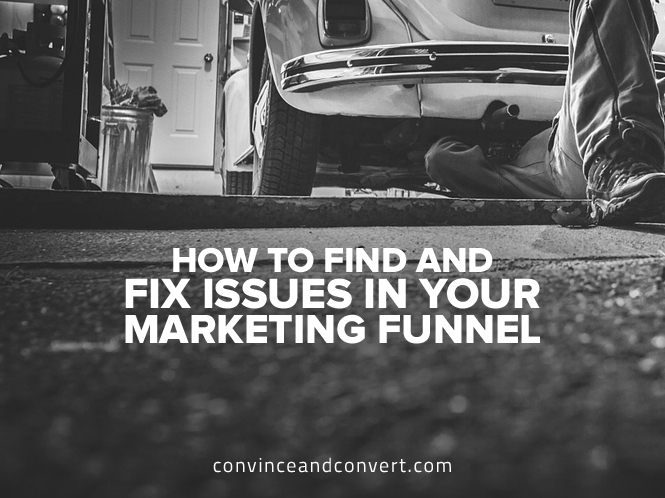 In order to find and fix issues with your sales and marketing funnel, and ultimately come up with a way to improve your bottom line, you’ll need a baseline against which to draw comparisons. And that means collecting data—lots of it. Start with the basics. Harrisburg, Pennsylvania-based company WebpageFX created a highly useful marketing funnel tool to help fledgling or struggling businesses set the tone for their future initiatives. The tool asks for basic information, such as monthly visitors and your current conversion rate, to help you get a look at the bigger picture. You couldn’t diagnose an illness without knowing what “healthy” looks like, and you won’t be able to grow your revenue stream before you have strong, historical data from which to draw a comparison. We’ve already touched briefly on the importance of collecting data about your existing sales process in order to diagnose potential problems. Now, let’s get a bit more specific. It’s time to dive into your traffic by the day of week. We can defer once again to Google Analytics, but you can just as easily see actual usage data from your own website’s backend—particularly if you use something like WordPress or Medium to publish online. Does much of the traffic on your site come your way on Sundays? How about on national holidays? If you’re beginning to see patterns emerging, it’s time to capitalize on them. Apple, Inc. has made an art of targeting customers during peak shopping times. In particular, their Back to School promotions bring the house down each year, thanks to bundles and other promotions for people shopping for personal computers during this important time in their lives. You may not have the audience or the reach that Apple does, but you can still react to periods of higher traffic by offering discounts or special offers of your own when traffic is booming. Impressions from social channels like Instagram and Twitter have become all-important. Almost one third of the world’s population uses social media, so make sure you’re not leaving these valuable prospects on the table by leaving your publishing schedule to happenstance. Social media schedulers like HootSuite, Buffer, and others have built their business models around helping online retailers schedule their social media contributions in advance. It’s a perfect way to ensure you never fall behind, never fail to take advantage of peak traffic hours, and never have to scramble to publish a time-sensitive piece of marketing. You should build an online presence that requires as little micromanagement as possible, so you can develop a steady stream of incoming prospects. By scheduling these dispatches in advance, you can focus on the content itself rather than on nailing the timing. Clever and witty Twitter dispatches are all well and good, but if you really want to engage with your most likely prospects, it might be time to take your content offerings to the next level. A successful, up-and-coming provider of customer support called Help Scout is grabbing market share from their better-known competitors by following this precise formula. They know their ideal customers are both technologically savvy and extremely particular about the services they engage with. As a result, they’ve built a high-quality library of eBooks, white papers, and other in-depth resources that their customers can access for free. These aren’t throwaway freebies—they’re substantial, informative and legitimate sources of valuable information. In other words, they’ve positioned themselves as a thought leader in their industry. Have you? We’ve already mentioned the importance of gathering benchmarks in order to appraise your success (or lack thereof), but it’s equally as important to set concrete growth goals, so you can see how well you’re measuring up in the future. Successful resolutions (of the New Years’ variety and otherwise) depend upon clear goals. A Harvard University study tells us why: Human beings need a heady mixture of motivation and achievement in order to succeed. Online businesses are no different. Sometimes, the basic approach is the best. There are other methods out there for keeping tabs on your performance and goals, but an Excel spreadsheet might be the simplest and most effective tool at your disposal. A spreadsheet lets you set goals on a daily, weekly, and monthly basis and lets you effortlessly track how well you’re doing. You can record the number of emails you’ve sent, the number of phone calls you’ve had, and how many successful follow-ups you’ve secured. At an interval of your choosing, you can compare this “real” data with the goals you’ve set. Achieving steady growth requires something to measure it against—and in this case, your goals can point the way. It’s healthy to let your hopes and ambitions take the wheel, but it’s still important to keep your expectations realistic. Sometimes success is about little more than smoothing out speed bumps. You don’t need to completely reinvent the wheel when it comes to improving your marketing funnel.